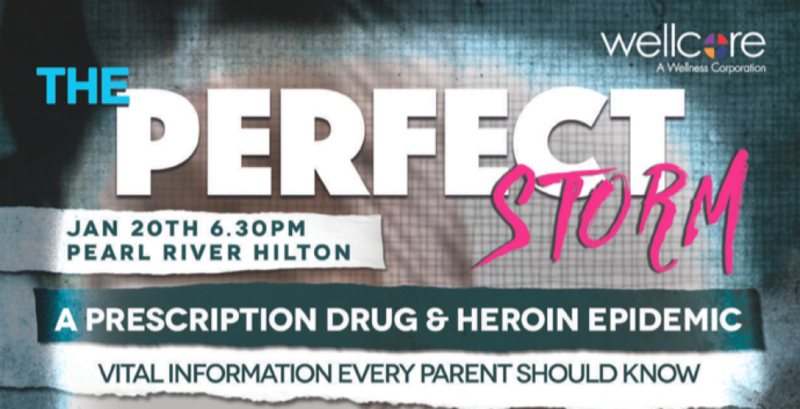 Wellcore invites the community to attend “The Perfect Storm: Battling The Drug Epidemic” on January 20, 2016 at 6:30 pm at the Pearl River Hilton in Pearl River, NY to learn about drug trends and how to prevent and understand the behaviors that lead to drug abuse. There will be a panel featuring Rockland County Supervising Assistant District Attorney Tina Guccione; Orangetown Police Captain Donald Butterworth; “Carole”, the mother of an addict; and “Steve” a recovering addict. Following the panel there will be time for Q&A. Also, we will be offering a break out room with tables of resources and spokespeople.